Kyle Peko. Credit: Ron Chenoy, USA Today Sports. Broncos claim Kevin Hogan from Washington. The Broncos claimed the former Stanford quarterback after an impressive showing with the Redskins this August. The news comes one day after the Broncos kept Chad Kelly and Paxton Lynch on the roster. Denver signed offensive lineman Austin Schlottmann to the practice squad per Mike Klis. Schlottmann stands at 6’6″ and 300 pounds, playing center at Texas Christian University but possessing a tackle’s build. Broncos will sign rookie safety Trey Marshall back to their practice squad tweeted Klis. Marshall is 6′ and 210 pounds, playing his college ball at Florida State and displayed his aggressive tackling abilities while with the Seminoles. Kyle Peko tweeted that he’s not done in Denver, so, he’ll likely be signed to the practice squad soon. Kyle is the cousin of Domata Peko, and he’s nearly as big as his older cousin. 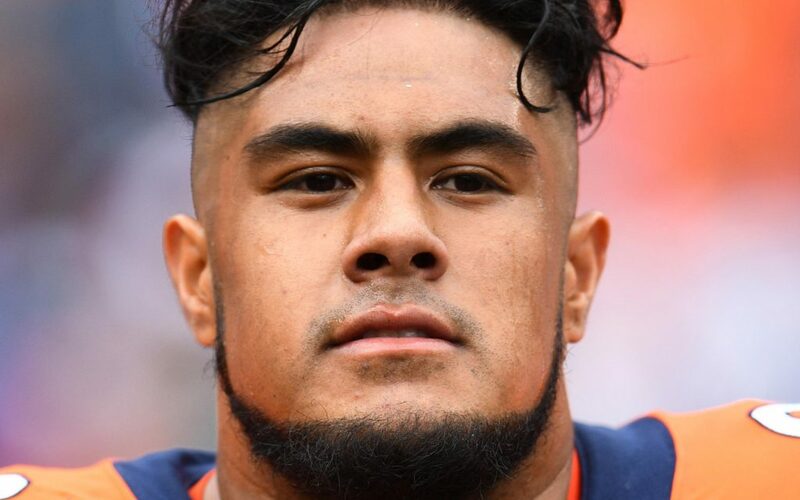 At 6’1″ and 305 pounds, Kyle Peko will be a valuable backup to Domata if and when the time comes. Peko’s been on the practice squad both in 2016 and 2017 for Denver, being promoted last November to the active roster. Tight end Brian Parker will be signed to the practice squad per Klis. The Broncos have signed River Cracraft to their practice squad per Troy Renck. Cracraft was cut by the team yesterday but has cleared waivers and will rejoin the team. He’s a 6′, 198-pound wideout who went undrafted out of Washington State. Klis reported that in addition to Cracraft, Denver signed Brendan Langley to the practice squad. Langley was a third-round pick by Denver in 2017. Isaiah McKenzie was also added back to the team, onto the practice squad. That makes seven players on the practice squad, leaving three spots open as of now. McKenzie had a lot of trouble holding onto the ball, fumbling six times last year, but he showed his explosive, play-making ability during preseason with the 78-yard touchdown return, too. The ninth practice squad player will be David Williams, running back and seventh-round draft pick this year, per Nicki Jhabvala. Williams played very well in the preseason and will help the Broncos depth at running back. Jeff Holland becomes the No. 10 player for the Broncos practice squad. Holland impressed all training camp and preseason long. This was a great re-signing. And No. 11 is DeShawn Williams. The Broncos will only keep 10 on the practice squad, but Carlos Henderson is suspended for Week 1, allowing them to bring in Williams, too. No Broncos players were claimed off waivers, which means the team is less talented than they likely hoped to be. We’ll keep bringing you the updates as they roll in, so check back often!